piece to each woman’s wardrobe, and needless to say one of the first things most people would notice. Women look at their bags today as an essential investment and a token of social status. Hermes, Prada and Gucci and the rest of the known brands tend to be many people’s obsession nowadays, which sell for hundreds of thousands. But in the last couple of years many new names are making their way on the fashion scene with creative new pieces that can be seen on fashionistas around the world. 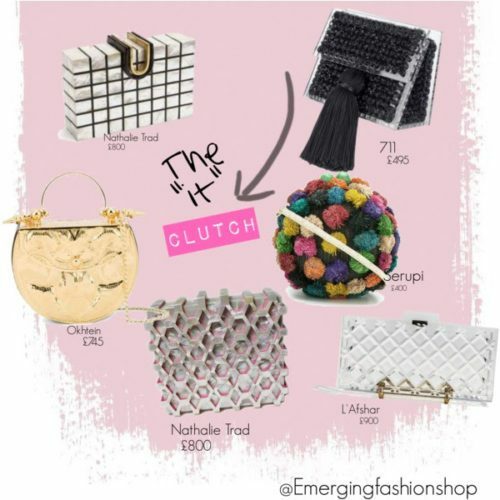 In this article, I’ve chosen a few of the “it” clutches by some bright and upcoming fashion talents, so be ready to feast your eyes on these beauties. Let’s start with Nathalie Trad, a young Lebanese designer raised in Dubai who developed a strong taste for asymmetric patterns and the use of geometric shapes. In 2013 her brand was founded, and today her pieces are sold all around the world. Luckily for every fashion savvy girl in Zurich, they are available at Tasoni Zurich. Seen on A-list stars such as Gigi Hadid and Kris Jenner, Okhtein certainly made a name for themselves in the fashion world. Okhtein an Arabic word meaning two sisters, says it all in the name, is founded by two Egyptian sisters who had a deep love affair with fashion and a dream of bringing Egyptian design and craftsmanship in their work. The use of metal and leather creates a traditional yet a modern feel to their pieces, and can be worn casually or for a special event. Born and made in Georgia, 0711 is definitely one of the top innovative brands that mix modern materials with traditional Georgian craftsmanship of knitting. Started by two local girls in 2012, 0711 has rapidly grown from locally grown brand to one of the most desired international “it” bags. You can find 0711 at the online Georgian platform More is Love alongside many other talented European designers. L’Afshar, is another Dubai based designer who became known for her signature classic clutch. Her crystal and marble dream journey started in 2014 inspired by Lilian Afshar’s travels and experiences with a sophisticated marble patterns and other captivating textures. The Brazilian designer behind the colourful brand Serpui has a beautiful story to tell and of course some amazing pieces to offer. Her inspiration is coming from her childhood and her fond memories about her mother’s intricate handbags. Her visions encouraged her to create some of her most beautiful pieces using gemstones, straw and exotic flowers. I hope these beautiful pieces fired up your imagination to upgrade your fashionable look this summer! Happy shopping!